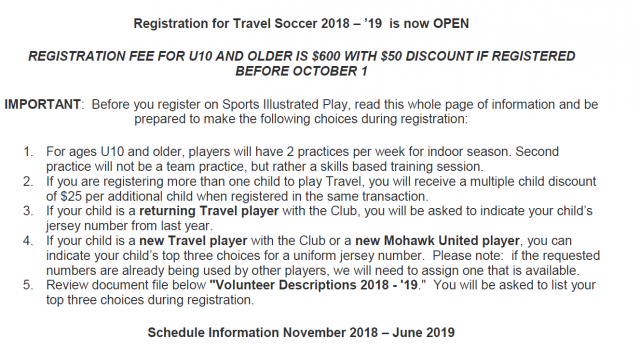 Updated Tuesday October 23, 2018 by Niskayuna Soccer Club/ Mohawk United. For ages U10 and older, players will have 2 practices per week for indoor season. Second practice will not be a team practice, but rather a skills based training session. If you are registering more than one child to play Travel, you will receive a multiple child discount of $25 per additional child when registered in the same transaction. If your child is a returning Travel player with the Club, you will be asked to indicate your child’s jersey number from last year. If your child is a new Travel player with the Club or a new Mohawk United player, you can indicate your child’s top three choices for a uniform jersey number. Please note: if the requested numbers are already being used by other players, we will need to assign one that is available. Review document file below "Volunteer Descriptions 2018 - '19." You will be asked to list your top three choices during registration. November – April: Indoor practices at the Schenectady Armory and/or Niskayuna school gyms; indoor soccer league play. April – June: Outdoor practices and games as part of Capital District Youth Soccer League (CDYSL). U8: $350 for one practice per week. $600 for two indoor practices during November – April winter session. Payments: Installment of $275 due upon registration; balance of fees due by January 15th. Uniform, approximately, $90. We are keeping the same uniform as last year, this is only if you are a new player or need a new uniform. Uniform jersey numbers: returning players who need jerseys and shorts will continue using the same jersey number. New players will be assigned a jersey number from the Club. Uniform ordering information: New players must get a jersey number from the club before ordering a uniform. Details to follow soon. Travel players – definition: Travel players practice and play in games and tournaments starting in November for indoor leagues including (10) CDYSL outdoor games in April – June. Rec Plus players - definition: Rec Plus players can participate as Travel players except for the (10) CDYSL outdoor games in the spring. How are Rec Plus players determined? While most or possibly all players will be designated as “Travel,” determination of Rec Plus players is the coach’s decision based on roster sizes and the coach’s situation. IF your team is in this situation, travel vs rec plus players will be determined by registration date. Rosters change during the year, and coaches will do all they can to allow all interested players to participate as Travel players. Please register by September 20. to ensure completion of club administration needs and issuance of uniforms for start of season in November.